The view looking down Soldier Canyon with the large limestone gate at the bottom of the canyon. A large, dry wash empties out of the Oquirrh Mountains about two miles southeast of Stockton and terminates to the west at Rush Lake. This wash is the mouth of Soldier Canyon, which is a long and significant east-west trending canyon that cuts deep into the Oquirrh Mountains. Rocky Peak’s 10,273-foot-high summit sits atop the east ridge at the head of the canyon and looms over the terrain. The south wall of the canyon is heavily forested with aspen and fir culminating on 10,006-foot-high Sharp Mountain. The north wall of the canyon is much different. 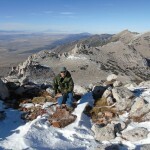 The ridge is capped by shorter 9,183-foot-high Edwards Peak. Due to the southwest-facing aspect of this ridge, its rocky slopes are covered with gambel oak, juniper and pinyon pine. Pinyon pine are also referred to as “Nut Pine” because of the pine nuts that Native Americans used to gather from them to supplement their diet. 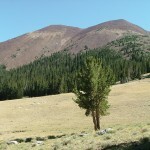 Many people, especially in the ranges of eastern Nevada, continue to harvest pine nuts every year by the sack. In the canyon, above the point where Stockton extracts its municipal water supply, a clear stream roils through evergreens. In the side canyons are numerous springs, some of which produce muddy bogs or tiny streams that roll over rocks covered with green moss. This pleasant, quiet canyon is guarded by a limestone reef at its mouth that rises from the canyon road to over 300 feet. The reef appears impressively while descending the canyon with Rush Valley and the Stansbury Range behind in the distance. The canyon’s creek bottom is lined with birch, cottonwood, box elder, rocky mountain maple, gambel oak and various other riparian-type trees. These trees are colorful in the fall and provide shelter for wildlife. I imagine that before there was a town of Stockton, a strong stream flowed down the canyon, possibly all the way to Rush Lake. Along the road there are thick clumps of rabbit brush, sagebrush and tan range grasses that provide a striking contrast to the dense evergreen forests high in the canyon. The canyon got its name from soldiers who used its natural resources while Lt. Col. Edward Steptoe and his command were encamped near Rush Lake. Col. Patrick Edward Connor, the founder of Stockton, also used the canyon’s potential for timber and water in the early 1860s, and no doubt prospected with his soldiers, too. 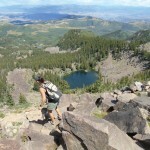 Soldier Canyon is one of my favorite places to hike, even though access is limited due to private property. The canyon road is open to travel, but most, if not all, property on either side of the road is private. While there, respect private property and stay on the main road. 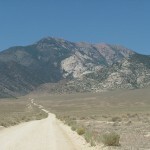 However, there is a great connecting road open for foot, horse and even ATV use to the top of Soldier Canyon. It meets a locked gate and then switches back hard to the southwest, down across the bottom of a draw through the woods and then climbs South Fork Canyon to a pass at 8,527 feet in elevation. From this pass, you can look down into upper Ophir Canyon. It is possible to make a 16.5-mile loop around Sharp Mountain and down Jacob City Road. 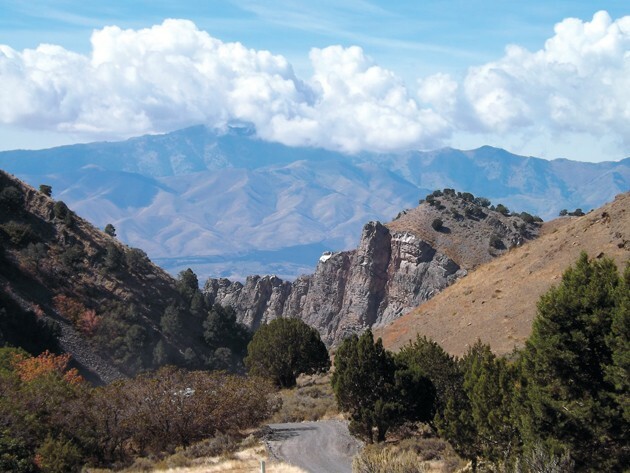 This route is a little-known jewel of a trail through patches of thick woods, across the face of a 10,000-foot-high peak and then down the old toll road that empties out where Soldier Canyon Road begins. Soldier Canyon can be enjoyed in all seasons and is an attractive snowshoeing/nordic skiing option. Unlike the Wasatch Range to the east or the Stansbury Range to the west, avalanche danger is less of a worry in the canyon bottoms here. Making the loop in the winter would be an accomplishment due to the distance and elevation gain involved. How to get there: Take SR-36 south out of Tooele to Stockton. Turn left onto Silver Avenue. Proceed east and past a park and baseball diamond. A short distance after the park the road will reach the bottom of a draw and head east towards the mountains. After a short distance, the asphalt will switch to gravel and a prominent dirt road will break off to the right and head south. This is the old Jacob City toll road. Stay on the main road and follow it east into the canyon past the Stockton City Water Filtration Plant. After entering the canyon, the limestone reef will be to the left. The road is passable for most vehicles but becomes rocky during the final steep ascent to the gate where the creek is piped out. Almost halfway up the canyon are some old rock ruins poking out of the sage and rabbit brush. They are the remains of old charcoal kilns used to produce fuel that fired the old Chicago and Waterman Smelters near Stockton back in the 1870s. The kilns have been frequent targets of vandals. Next week’s article will look at the history of the kilns and advocate for their protection. The ruins are possibly the best example of charcoal kilns that were used widely across the west in pioneer-era mining operations.